This new characterful beamed studio with stand stone links to the 1870's cottage and the quality light airy interior was built to house Jan's Artwork which has been exhibited around the UK/abroad ( so is full of light and brings the garden and Kymin views directly into the building to be enjoyed! Jan's work is left for your enjoyment. This is a truly lovely apartment now which is only a lovely short walk from town, the river, golf course and adjacent to fields. The 360 views are truly beautiful and they add to our love of both worlds - what we love outside & what we need & like in town - and it is such a lovely town! Just Google it or check out for local attractions. Outstanding, could not have been a better place to stay. A simply outstanding location to stay. Has everything you could want in a holiday home. Very quiet location only a short walk into town. I have stayed in many holiday homes over the years, but none have been as good as this one. I will be back, thank you very much for a lovely stay. Really nice studio with great touches that helped to make the stay even more special. Quiet and beautiful setting with a short walk into the town. Highly recommended and much appreciated. Lovely short stay to explore the area! Richard and Jan very helpful! We will be back! Well appointed studio apartment within walking distance to town and River Wye walks. Must share location with guests in adjoining cottage. 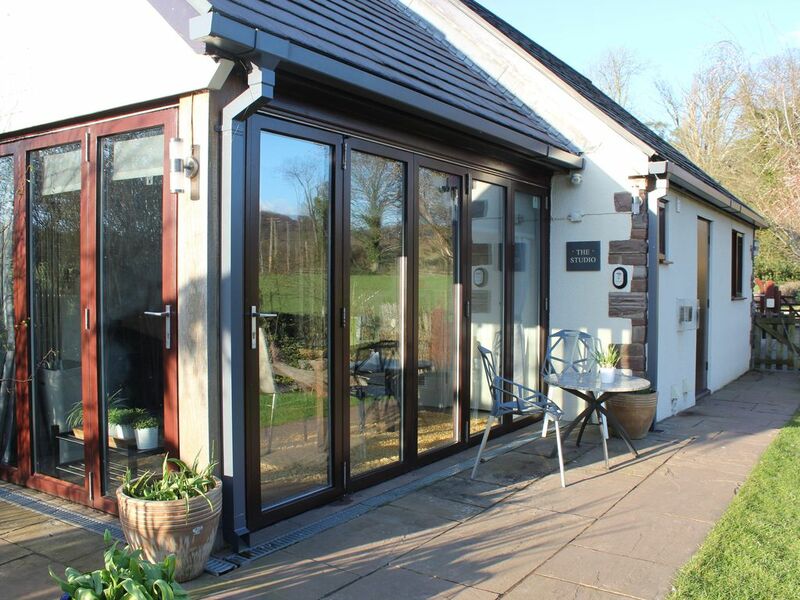 An absolutely Ideal location for walkers walking direct from your Independent Studio Apartment door, playing golf up the lane at Monmouth Golf Course or at the Rolls Monmouth, Celtic Manor(Ryder Cup etc) fishing in the River Wye, or hiking to Symonds Yat, & enjoying canoeing, boat trips. Walk up to The Saracens Head for lunch. Drive into the Forest of Dean for sculptural trails and camping or on to cities Cheltenham, Bristol or Cardiff. Then there is the beautiful Brecon Beacons too & Abergavenny Food Festival & Award winning Hardwick & chefs Steven Terry & Matt Tebbitt nearby! Take a trip to Tintern Abbey & Tintern Station is a place our children loved to explore. Monmouth Town is just a pleasant ten minute walk away and offers Leisure Facilities, individual shops and main retailers.M&S Simply Food & Waitrose are open late & Woods of Whitchurch offers a host of luxury goods. The Monmouthshire Show is held each year, as is the Hay on Wye Literary Festival. Then there is the beautiful Wye Valley and Tintern Abbey & Tintern Station is a place our children loved to explore! The best of both worlds - countryside, animals & fauna & a 10 minute walk into town & good road links too - We love it! - From the beautiful views onsite and from the door! The whole 1870's cottage will also be available to let soon as an extra 6 bed - 2 kings one double, Rayburn, 2 fires, Hydrosonic, Teuco Bath, walk in shower beautiful garden with stream - The Leasbrook - & lounge seats.